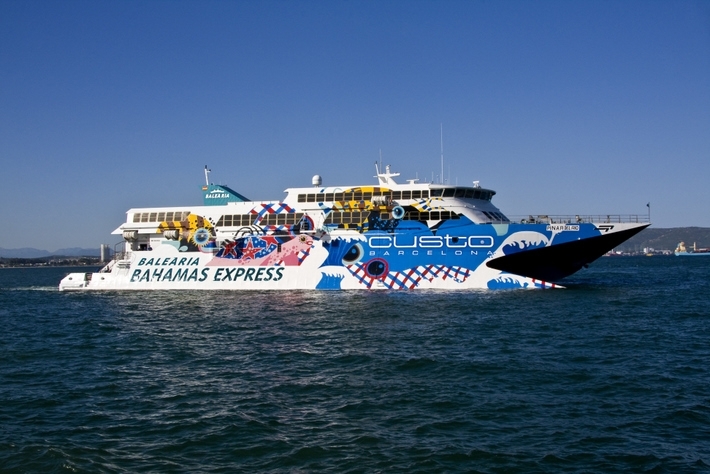 Browse: Home > Bahamas Express Fast Ferry Service to Bimini! Bahamas Express Fast Ferry Service to Bimini! Looking for the Resorts World SuperFast Cruise Ship to Bimini? Click here! Its official and very exciting. You can now book a fast ferry to Bimini starting February 8th! The non-stop high-speed ferry to Bimini is a big game changer for the Island and we certainly wish them the best in their endeavor! Here’s more information from the Bahamas Express website. Bahamas Express is a company dedicated to maritime transport, that offers fast-ferry service between Port Everglades (Florida) and Bahamas (Bimini and Grand Bahama island). It is owned mostly by the Spanish group Baleària and the local partner, the Capo group. The company is also working on opening a new line with Bimini Island. The Baleària Group is a leading Spanish shipping company which specializes in the transportation of people and roll on/roll off cargo in the Spanish Mediterranean. Baleària operates routes between mainland Spain and the Balearic Islands, as well as connections between the islands themselves. It is the only shipping company which has daily inter-island connections. Moreover, Baleària is the second largest operator in terms of passenger numbers in the Strait of Gibraltar (the principal connecting point between Europe and Africa) where it has been operating since 2003. In total, it operates 21 routes with ferry or fast ferry services, in accordance with the distance and requirements of the passengers. Baleària considers quality service adapted to the needs of its passengers essential, so it maintains a continuous commitment to modernizing its fleet with new generation ships. In the last two years, the company has added four new-build ships with a value of $459 million to its fleet. During the 2011 fiscal year, Baleària transported nearly 3 million passengers (more than half on high-speed ships) and 3 million lineal metres (U.S.?) of roll on/roll off cargo. From completely private capital, Baleària directly employs nearly 1,000 people, including ship and ground staff members. Balearia owns 15 ships, which are both ferries and fast ferries. Visit Now! Visit their site today! Need to contact us? Please use our contact form or our postal address in Miami listed below.